Industry and regulatory uncertainty are forcing financial executives to reestablish company spending goals while instilling strong accountability benchmarks. Connecting with executives across the industry gives leaders new perspectives and greater tools to discover solutions to these financial challenges. Spending and accountability trends are especially important for leaders to successfully navigate their companies toward growth. To understand more about spending and accountability, we turn to Jill McConnell, Vice President of Finance, U.S. Pharmaceuticals at GlaxoSmithKline, Alan Bucher, Vice President of Finance, Orthopedics and Tissue Technologies at Integra LifeSciences, and Sandra Clarke, Senior Vice President of Finance and CFO at Daiichi Sankyo, Inc.
Financial responsibility is a team effort. Collaborating with business units means being able to see the red flags. Open communication channels are essential to a proactive approach towards addressing potential problems. For Jill McConnell, the ability to evolve investment strategies and re-prioritize as business needs change is crucial to a healthy financial culture. “Hearing that this is how they’ve always done it is a flag that the activities are ripe for re-evaluation,” she explains. “If a unit cannot speak to the current ROI of their spend or is hesitant to make trade-offs as new opportunities emerge, I know that I need to evaluate their spending trends.” Evolving investment and spending strategies is crucial to unit and company growth. Preparing units and departments to grow healthy evaluation strategies begins with communication for Alan Bucher, “Having regular check-ins with unit and company leadership gives everyone time to prepare for new strategies while evaluating prior decisions. These standing meetings can help the unit grow while ensuring a positive relationship with finance.” Meeting with leadership also decreases the chances of unknown mistakes or financial difficulty. Bucher and McConnell agree that trust needs to come next. Bucher explains, “We want leadership to see finance as a resource that can help guide them towards growth and success.” Encouraging unit leadership to seek guidance and resources from corporate and commercial finance can strengthen company relations and support financial goals. Smaller companies, however, should be thinking about the big picture. “Department spending trends,” says Clarke, “will have a bigger impact in smaller companies. If you set high level group or unit spending goals, the accountability is less clear. However, if you set lower level spending goals, people may not invest in revenue growth opportunities for fear of being penalized on the spending. It’s important to have a process that allows flexibility or forgiveness for appropriate, approved spending deviations so you don’t negatively impact future growth.” Keeping size and industry in mind is also important in evaluating spending and accountability trends. If a company is comprised of different industries, different financial goals and benchmarks are necessary to promote company success. Measuring the success of these goals is done through thorough benchmark analysis. However, defining those benchmarks can create tension within a company as every group wants to position their measures in a way that is most favorable for them. McConnell explains, “the hardest part about metric implementation is deciding on the right ones. The right lead indicators, proactively managed, ensure that your lag measures will perform as intended. Companies need to ask themselves about their growth, goals, and how quickly they need to see results – you need separate measures for day-to-day operational objectives as well as longer-term strategic priorities.” McConnell also suggests that companies need to always be thinking about future goals and opportunities – the measurement system needs to be flexible and fit-for-purpose. Bucher suggests paying attention to the budget –whether under or over, “Ensuring that a department is watching their budget and remaining accountable for any misgivings is crucial. Even if spending comes in under budget, we need to know whether that is positive or not. Was something forgotten? How can we accurately measure spending accountability in the unit?” Remaining aware of budget increases and decreases can help companies accurately map spending and investment strategies, post evaluation. Accessing and utilizing the correct financial resources is the first step to evaluating and redefining spending and accountability success. This importance leads many executives to seek cross-industry collaboration and relationship. The ability to engage with a varied group of financial executives enables leaders from different business backgrounds to share best practices and easily navigate industry challenges. 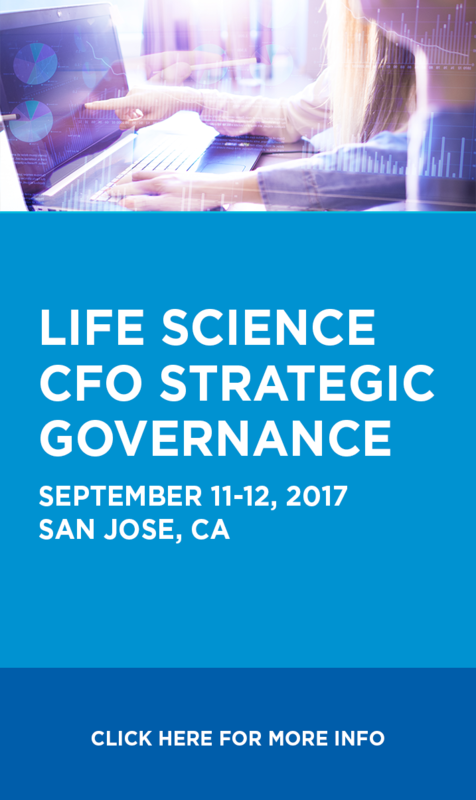 To learn more about spending and accountability in the life science industry, or to discuss pressing industry challenges with Sandra Clarke and Alan Bucher, register for the Life Science CFO Strategic Governance Forum, September 11-12 in San Jose, CA. Missed the east cast CFO event with Jill McConnell? Read the recap here!